There are often questions raised about where charity donations end up. People donate in order to help worthy causes, choosing to help a variety of issue, be it fighting diseases or illnesses or helping people in famine-stricken countries, among many more. But once the money has been given there are no processes in place to update people on where exactly their money is going, how it is being used, how it is split. The charity itself can provide reports and stories about such, but these are often just snippets and examples. And it is unlikely that anyone but the most dedicated or interested would read through an invoice detailing where every penny has gone. But this not knowing can be harmful to the charity, as some people are more reluctant to donate their money when they aren’t assured that it is going to be used in the best possible ways. There are often stories about the money going directly to corrupt governments rather than the people who really need it, or a large proportion of the money being used for the charity’s own benefit, such as admin fees. All of this can put people off and lead to a lack of much needed funds. Which has led to Oxfam’s See For Yourself campaign. It is a scheme that takes Oxfam supporters out to see first-hand just what the donations are doing and how and where they are being used. "Until you see it for yourself, it can be hard to understand how giving £3 a month to Oxfam can transform people's lives. So we've done something completely new. We're taking people like you out to see our work first-hand and meet the people they're helping (costs are covered by an anonymous donor). We believe it's the best way to show you what regular donations can really do." A video is included showing Oxfam supporter Jodie Sandford’s travels to see the work that Oxfam does, travelling with the charity to Zimbabwe. There she was shown the projects that have been undertaken by Oxfam over the years, their effects in the communities and given the opportunity to see first-hand just where donations go. “What's clear to me is that simply giving people food or clothes or whatever else, just isn't enough. The families I met all just wanted to be given support they need to earn a living, put food on the table and send their kids to school - the same things as you and me. 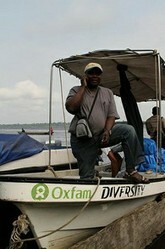 And that's what Oxfam's doing with regular gifts - helping people find long-term solutions to their problems."